One year after 1.8.0 comes 1.9.0. This one's primary target is a significant technical improvement over 1.8, bringing much higher multi-threaded performance, improvements on connection management, process management, caching, H2... Please read the announcement here and the detailed blog article for more information. An important point to note, this technical release is not suitable for inclusion in distros, as it will only be maintained for approximately one year (till 2.1 is out). Version 2.0 coming in May will be long-lived and more suitable for distros. One year after 1.7.0, we're pleased to announce release 1.8.0, which is by far the most feature-rich version ever produced. Read the announcement here for more information. Version 1.2 has been in production use since 2006 and provided an improved performance level on top of 1.1. It is not maintained anymore, as most of its users have switched to 1.3 a long time ago. Version 1.1, which has been maintaining critical sites online since 2002, is not maintained anymore either. Users should upgrade to 1.4 or 1.5. Highest performance is achieved with modern operating systems supporting scalable polling mechanisms such as epoll on Linux 2.6/3.x or kqueue on FreeBSD and OpenBSD. This requires haproxy version newer than 1.2.5. Fast data transfers are made possible on Linux 3.x using TCP splicing and haproxy 1.4 or 1.5. Forwarding rates of up to 40 Gbps have already been achieved on such platforms after a very careful tuning. While Solaris and AIX are supported, they should not be used if extreme performance is required. Current typical 1U servers equipped with a dual-core Opteron or Xeon generally achieve between 15000 and 40000 hits/s and have no trouble saturating 2 Gbps under Linux. Well, since a user's testimony is better than a long demonstration, please take a look at Chris Knight's experience with haproxy saturating a gigabit fiber in 2007 on a video download site. Since then, the performance has significantly increased and the hardware has become much more capable, as my experiments with Myricom's 10-Gig NICs have shown two years later. Now as of 2014, 10-Gig NICs are too limited and are hardly suited for 1U servers since they do rarely provide enough port density to reach speeds above 40-60 Gbps in a 1U server. 100-Gig NICs are coming and I expect to run new series of tests when they are available. O(1) event checker on systems that allow it (Linux and FreeBSD) allowing instantaneous detection of any event on any connection among tens of thousands. Zero-copy forwarding is possible using the splice() system call under Linux, and results in real zero-copy starting with Linux 3.5. This allows a small sub-3 Watt device such as a Seagate Dockstar to forward HTTP traffic at one gigabit/s. Work factoring, such as multiple accept() at once, and the ability to limit the number of accept() per iteration when running in multi-process mode, so that the load is evenly distributed among processes. Tree-based storage, making heavy use of the Elastic Binary tree I have been developping for several years. This is used to keep timers ordered, to keep the runqueue ordered, to manage round-robin and least-conn queues, to look up ACLs or keys in tables, with only an O(log(N)) cost. Optimized timer queue : timers are not moved in the tree if they are postponed, because the likeliness that they are met is close to zero since they're mostly used for timeout handling. This further optimizes the ebtree usage. optimized HTTP header analysis : headers are parsed an interpreted on the fly, and the parsing is optimized to avoid an re-reading of any previously read memory area. Checkpointing is used when an end of buffer is reached with an incomplete header, so that the parsing does not start again from the beginning when more data is read. Parsing an average HTTP request typically takes half a microsecond on a fast Xeon E5. In production, HAProxy has been installed several times as an emergency solution when very expensive, high-end hardware load balancers suddenly failed on Layer 7 processing. Some hardware load balancers still do not use proxies and process requests at the packet level and have a great difficulty at supporting requests across multiple packets and high response times because they do no buffering at all. On the other side, software load balancers use TCP buffering and are insensible to long requests and high response times. A nice side effect of HTTP buffering is that it increases the server's connection acceptance by reducing the session duration, which leaves room for new requests. This factor is very important, because it directly determines when the load balancer will not be able to distribute all the requests it receives. It is mostly dependant on the CPU. Sometimes, you will hear about requests/s or hits/s, and they are the same as sessions/s in HTTP/1.0 or HTTP/1.1 with keep-alive disabled. Requests/s with keep-alive enabled is generally much higher (since it significantly reduces system-side work) but is often meaningless for internet-facing deployments since clients often open a large amount of connections and do not send many requests per connection on avertage. This factor is measured with varying object sizes, the fastest results generally coming from empty objects (eg: HTTP 302, 304 or 404 response codes). Session rates around 100,000 sessions/s can be achieved on Xeon E5 systems in 2014. This factor is tied to the previous one. Generally, the session rate will drop when the number of concurrent sessions increases (except with the epoll or kqueue polling mechanisms). The slower the servers, the higher the number of concurrent sessions for a same session rate. If a load balancer receives 10000 sessions per second and the servers respond in 100 ms, then the load balancer will have 1000 concurrent sessions. This number is limited by the amount of memory and the amount of file-descriptors the system can handle. With 16 kB buffers, HAProxy will need about 34 kB per session, which results in around 30000 sessions per GB of RAM. In practise, socket buffers in the system also need some memory and 20000 sessions per GB of RAM is more reasonable. Layer 4 load balancers generally announce millions of simultaneous sessions because they need to deal with the TIME_WAIT sockets that the system handles for free in a proxy. Also they don't process any data so they don't need any buffer. Moreover, they are sometimes designed to be used in Direct Server Return mode, in which the load balancer only sees forward traffic, and which forces it to keep the sessions for a long time after their end to avoid cutting sessions before they are closed. This factor generally is at the opposite of the session rate. It is measured in Megabytes/s (MB/s), or sometimes in Gigabits/s (Gbps). Highest data rates are achieved with large objects to minimise the overhead caused by session setup and teardown. Large objects generally increase session concurrency, and high session concurrency with high data rate requires large amounts of memory to support large windows. High data rates burn a lot of CPU and bus cycles on software load balancers because the data has to be copied from the input interface to memory and then back to the output device. Hardware load balancers tend to directly switch packets from input port to output port for higher data rate, but cannot process them and sometimes fail to touch a header or a cookie. Haproxy on a typical Xeon E5 of 2014 can forward data up to about 40 Gbps. A fanless 1.6 GHz Atom CPU is slightly above 1 Gbps. A load balancer's performance related to these factors is generally announced for the best case (eg: empty objects for session rate, large objects for data rate). This is not because of lack of honnesty from the vendors, but because it is not possible to tell exactly how it will behave in every combination. So when those 3 limits are known, the customer should be aware that it will generally perform below all of them. A good rule of thumb on software load balancers is to consider an average practical performance of half of maximal session and data rates for average sized objects. You might be interested in checking the 10-Gigabit/s page. Being obsessed with reliability, I tried to do my best to ensure a total continuity of service by design. It's more difficult to design something reliable from the ground up in the short term, but in the long term it reveals easier to maintain than broken code which tries to hide its own bugs behind respawning processes and tricks like this. In single-process programs, you have no right to fail : the smallest bug will either crash your program, make it spin like mad or freeze. There has not been any such bug found in stable versions for the last 13 years, though it happened a few times with development code running in production. HAProxy has been installed on Linux 2.4 systems serving millions of pages every day, and which have only known one reboot in 3 years for a complete OS upgrade. Obviously, they were not directly exposed to the Internet because they did not receive any patch at all. The kernel was a heavily patched 2.4 with Robert Love's jiffies64 patches to support time wrap-around at 497 days (which happened twice). On such systems, the software cannot fail without being immediately noticed ! Right now, it's being used in many Fortune 500 companies around the world to reliably serve billions of pages per day or relay huge amounts of money. Some people even trust it so much that they use it as the default solution to solve simple problems (and I often tell them that they do it the dirty way). Such people sometimes still use versions 1.1 or 1.2 which sees very limited evolutions and which targets mission-critical usages. 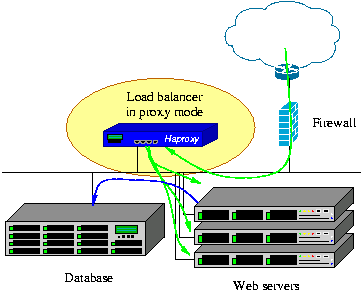 HAProxy is really suited for such environments because the indicators it returns provide a lot of valuable information about the application's health, behaviour and defects, which are used to make it even more reliable. Version 1.3 has now received far more testing than 1.1 and 1.2 combined, so users are strongly encouraged to migrate to a stable 1.3 or 1.4 for mission-critical usages. As previously explained, most of the work is executed by the Operating System. For this reason, a large part of the reliability involves the OS itself. Latest versions of Linux 2.4 have been known for offering the highest level of stability ever. However, it requires a bunch of patches to achieve a high level of performance, and this kernel is really outdated now so running it on recent hardware will often be difficult (though some people still do). Linux 2.6 and 3.x include the features needed to achieve this level of performance, but old LTS versions only should be considered for really stable operations without upgrading more than once a year. Some people prefer to run it on Solaris (or do not have the choice). Solaris 8 and 9 are known to be really stable right now, offering a level of performance comparable to legacy Linux 2.4 (without the epoll patch). Solaris 10 might show performances closer to early Linux 2.6. FreeBSD shows good performance but pf (the firewall) eats half of it and needs to be disabled to come close to Linux. OpenBSD sometimes shows socket allocation failures due to sockets staying in FIN_WAIT2 state when client suddenly disappears. Also, I've noticed that hot reconfiguration does not work under OpenBSD. The reliability can significantly decrease when the system is pushed to its limits. This is why finely tuning the sysctls is important. There is no general rule, every system and every application will be specific. However, it is important to ensure that the system will never run out of memory and that it will never swap. A correctly tuned system must be able to run for years at full load without slowing down nor crashing. Anyway, much care is taken when writing code to manipulate headers. Impossible state combinations are checked and returned, and errors are processed from the creation to the death of a session. A few people around the world have reviewed the code and suggested cleanups for better clarity to ease auditing. By the way, I'm used to refuse patches that introduce suspect processing or in which not enough care is taken for abnormal conditions. proper request encoding ensures the requestor cannot hide non-printable characters, nor fool a terminal. arbitrary request and response header and cookie capture help to detect scan attacks, proxies and infected hosts. timers help to differentiate hand-typed requests from browsers's. 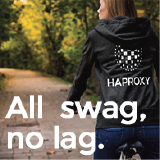 HAProxy also provides regex-based header control. Parts of the request, as well as request and response headers can be denied, allowed, removed, rewritten, or added. This is commonly used to block dangerous requests or encodings (eg: the Apache Chunk exploit), and to prevent accidental information leak from the server to the client. Other features such as Cache-control checking ensure that no sensible information gets accidentely cached by an upstream proxy consecutively to a bug in the application server for example. Some patches for Stunnel by HAProxy Technologies (formerly Exceliance), such X-Forwarded-For, send-proxy, unix-sockets, multi-process SSL session synchronization, transparent binding and performance improvements. http://www.haproxy.com/download/free/patches/linux/epoll-2.4/ : kernel patches to enable epoll on standard Linux 2.4 kernels and on Red Hat Enterprise Linux 3. Browse directory for other (outdated) patches. There are three types of documentation now : the Reference Manual which explains how to configure HAProxy but which is outdated, the Architecture Guide which will guide you through various typical setups, and the new Configuration Manual which replaces the Reference Manual with more a explicit configuration language explanation. The official documentation is the pure-text one provided with the sources. However, Cyril Bonté's automated conversion to HTML is much easier to use and constantly up to date, so it is the preferred one when available. In addition to Cyril's HTML converter above, an automated format converter is being developed by Pavel Lang. At the time of writing these lines, it is able to produce a PDF from the documentation, and some heavy work is ongoing to support other output formats. Please consult the project's page for more information. Here's an example of what it is able to do on version 1.5 configuration manual. 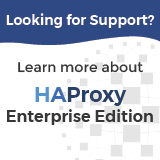 install HAProxy Enterprise Edition (HAPEE), which is a long-term maintained HAProxy package accompanied by a well-polished collection of software, scripts, configuration files and documentation which significantly simplifies the setup and maintenance of a completely operational solution ; it is particularly suited to Cloud environments where deployments must be fast. try an ALOHA appliance (hardware or virtual), which will even save you from having to worry about the system, hardware and from managing a Unix-like system. I also find it important to credit Loadbalancer.org. I am not affiliated with them at all but like us, they have contributed a fair amount of time and money to the project to add new features and they help users on the mailing list, so I have some respect for what they do. 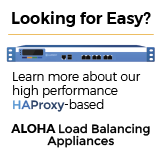 They're a UK-based company and their load balancer also employs HAProxy, though it is somewhat different from the ALOHA. Some happy users have contributed code which may or may not be included. Others spent a long time analysing the code, and there are some who maintain ports up to date. The most difficult internal changes have been contributed in the form of paid time by some big customers who can afford to pay a developer for several months working on an opensource project. Unfortunately some of them do not want to be listed, which is the case for the largest of them. Some contributions were developped and not merged, most often by lack of sign of interest from the users or simply because they overlap with some pending changes in a way that could make it harder to maintain future compatibility. Quite some time ago now, Cyril Bonté contacted me about a very interesting feature he has developped, initially for 1.4, and which now supports both 1.4 and 1.5. This feature is Geolocation, which many users have been asking for for a long time, and this one does not require to split the IP files by country codes. In fact it's extremely easy and convenient to configure. The feature was not merged yet because it does for a specific purpose (GeoIP) what we wanted to have for a more general use (map converters, session variables, and use of variables in the redirect URLs), which will allow the same features to be implemented with more flexibility (eg: extract the IP from a header, or pass the country code and/or AS number to a backend server, etc...). Cyril was very receptive to these arguments and accepted to maintain his patchset out of tree waiting for the features to be implemented (Update: 1.5-dev20 with maps now make this possible). Cyril's code is well maintained and used in production so there is no risk in using it on 1.4, except the fact that the configuration statements will change a bit once you upgrade to 1.5. Neil Mckee posted a patch to the list in early 2013, and unfortunately this patch did not receive any sign of interest nor feedback, which is sad considering the amount of work that was done. I personally am clueless about sFlow and expressed my skepticism to Neil about the benefits of sampling some HTTP traffic when you can get much more detailed informations for free with existing logs. I agree that the logging you already have in haproxy is more flexible and detailed, and I acknowledge that the benefit of exporting sFlow-HTTP records is not immediately obvious. The value that sFlow brings is that the measurements are standard, and are designed to integrate seamlessly with sFlow feeds from switches, routers, servers and applications to provide a comprehensive end to end picture of the performance of large scale multi-tier systems. So the purpose is not so much to troubleshoot haproxy in isolation, but to analyze the performance of the whole system that haproxy is part of. Perhaps the best illustration of this is the 1-in-N sampling feature. If you configure sampling.http to be, say, 1-in-400 then you might only see a handful of sFlow records per second from an haproxy instance, but that is enough to tell you a great deal about what is going on -- in real time. And the data will not bury you even if you have a bank of load-balancers, hundreds of web-servers, a huge memcache-cluster and a fast network interconnect all contributing their own sFlow feeds to the same analyzer. Even after that explanation, no discussion emerged on the subject on the list, so I guess there is little interest among users for now. I suspect that sFlow is probably more deployed among network equipments than application layer equipments, which could explain this situation. The code is large (not huge though) and I am not convinced about the benefits of merging it and maintaining it if nobody shows even a little bit of interest. Thus for now I prefer to leave it out of tree. Neil has posted it on GitHub here : https://github.com/sflow/haproxy. Please, if you do use this patch, report your feedback to the mailing list, and invest some time helping with the code review and testing. This table enumerates all known significant contributions that led to version 1.4, as well as proposed fundings and features yet to be developped but waiting for spare time. It is not more up to date though. Some older code contributions which possibly do not appear in the table above are still listed here. Aleksandar Lazic and Klaus Wagner implemented this feature which was merged in 1.2. It allows the proxy to learn cookies sent by the server to the client, and to find it back in the URL to direct the client to the right server. The learned cookies are automatically purged after some inactive time. This patch for haproxy-1.2.14 was submitted by Oleksandr Krailo. It implements a basic least connection algorithm. I've not merged this version into 1.3 because of scalability concerns, but I'm leaving it here for people who are tempted to include it into version 1.2, and the patch is really clean. Aleksandar Lazic sent me this patch against 1.1.28 which in fact does two things. The first interesting part allows one to write a file enumerating servers which will have to be stopped, and then sending a signal to the running proxy to tell it to re-read the file and stop using these servers. This will not be merged into mainline because it has indirect implications on security since the running process will have to access a file on the file-system, while current version can run in a chrooted, empty, read-only directory. What is really needed is a way to send commands to the running process. However, I understand that some people might need this feature, so it is provided here. The second part of the patch has been merged. It allowed both an active and a backup server to share a same cookie. This may sound obvious but it was not possible earlier. Usage: Aleks says that you just have to write the server names that you want to stop in the file, then kill -USR2 the running process. I have not tested it though. Sébastien Brize sent me this patch against 1.1.27 which adds the 'weight' option to a server to provide smoother balancing between fast and slow servers. It is available here because there may be other people looking for this feature in version 1.1. I did not include this change because it has a side effect that with high or unequal weights, some servers might receive lots of consecutive requests. A different concept to provide a smooth and fair balancing has been implemented in 1.2.12, which also supports weighted hash load balancing. Usage: specify "weight X" on a server line. Note: configurations written with this patch applied will normally still work with future 1.2 versions. I implemented IPv6 support on client side for 1.1.27, and merged it into haproxy-1.2. Anyway, the patch is still provided here for people who want to experiment with IPv6 on HAProxy-1.1. Please browse the directory for other useful contributions. Very fast layer 3/4 load balancing merged in Linux 2.4 and 2.6 kernels. Should be coupled with Keepalived to monitor servers. This generally is the solution embedded by default in most IP-based load balancers. Nginx is an excellent piece of software. Initially it's a very fast and reliable web server, but it has grown into a full-featured proxy which can also offer load-balancing capabilities. Nginx's load balancing features are less advanced than haproxy's but it can do extra things (eg: caching, running FCGI apps), which explains why they are very commonly found together. I strongly recommend it to whoever needs a fast, reliable and flexible web server ! Pound is very small and reasonably good. It aims at remaining small and auditable prior to being fast. It used to support SSL and keep-alive before HAProxy. Its configuration file is small and simple. It's thread-based, but can be a simpler alternative to HAProxy for a small site when the flexibility and performance of HAProxy are not required. Pen is a very simple load balancer for TCP protocols. It supports source IP-based persistence for up to 2048 clients. Supports IP-based ACLs. Uses select() and supports higher loads than Pound but will not scale very well to thousands of simultaneous connections. It's more versatile however, and could be considered as the missing link between HAProxy and socat. Some people regularly ask if it is possible to send donations, so I have set up a Paypal account for this. Click here if you want to donate. Open Source Windows service for reporting server load back to HAProxy (load balancer feedback agent).